Sunday extended bench selections are in. The big news is Jimmy Bartel is out being managed. Jarrad Jansen, Archie Smith didn’t make the cut. 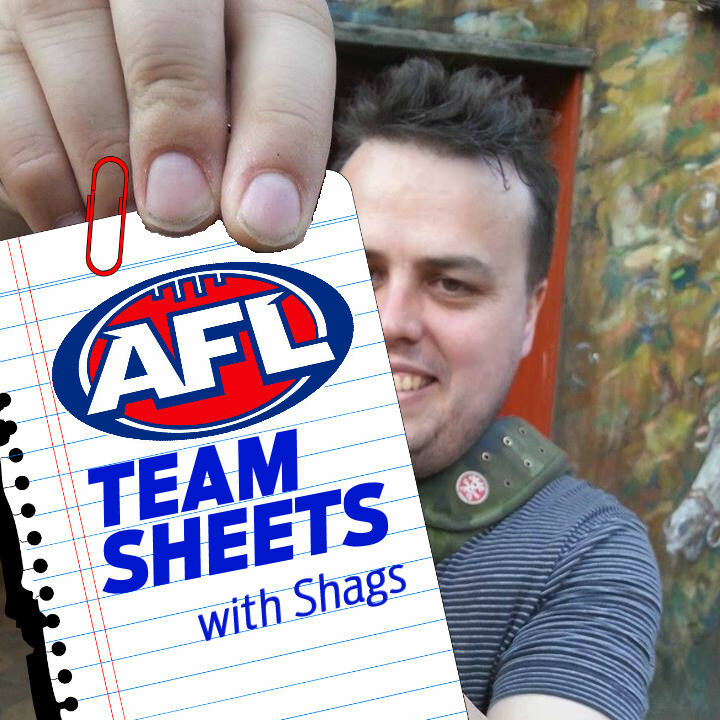 Round 22 Teamsheets are in! DT Gods have mostly been kind this week. Sam Jacobs is back, at rookie bench cover Reilly O’Brien’s expense, and another ruck option Kurt Tippett (Ruck/Fwd) is back for Sydney (lessening Naismiths potential). Biggest out is Taylor Adams with an ankle, and one or two may have had Chad Windgard as a POD, out with a hammie, and Matthew Suckling is out with an achilles injury again. A few new rookie priced options being played late in the season with Callum Moore (Fwd $125,000 AF $ 116,300 DT), Todd Elton (Def $125,000 AF $128,200 DT), Brayden Fiorini (Mid $166,000 AF $139,300 DT). and Josh Clayton (Def/Mid $125,000 AF $128,200 DT) confirmed to debut. Rd 22 teams named shortly on https://t.co/IBZE85KA6t & club sites. 26 changes to Fri / Sat teams. Three confirmed outs for Sunday squads. Jimmy Bartel, Josh Caddy withdrawn from rd22 Geel side v Bris, Sunday. George Horlin-Smith, Jordan Murdoch into 25. Sydney Swans have reinstated Kurt Tippett to the primary list from the long-term injury list. The Western Bulldogs have promoted Roarke Smith to the senior list under the rules relating to the promotion of a rookie after mid-season. The Adelaide Crows have placed Sam Shaw on the long-term injury list and upgraded Jonathon Beech from the rookie list as his replacement. Richmond has placed Jake Batchelor on the long-term injury list and upgraded Callum Moore from the rookie list as his replacement. Syd Swans have now upgraded Harrison Marsh to replace Michael Talia & Jordan Foote to replace Daniel Robinson under long-term injury rules. Jetta, Nelson in for Tunbridge, Barrass. Nic Naitanui (Ruck $404,000 AF be 84 $410,300 be 79 DT) comeback game last week was sensational, indeed match winning! That last snap alone makes him worthy of a watchlist nomination, and hes super cheap too boot. Could be a nice POD for a finals match up this week and cheap price might allow you to fix up other areas. Another big comeback very important for the Swans is Kurt Tippett (Ruck/Fwd $465,000 AF be 133 $476,800 be 129) as much on the watchlist for diminishing popular rookie ruck Naismiths point potential, could also be a good POD as his form before injury was very solid. Lambert, Elton, Menadue, C Moore for Vickery, Miles, Drummond, Lennon. Geary, Lonie, Holmes for Fisher, Hickey, Minchington. Double up up this week with two rookies from the Tigers. Wilson, Hopper for A Kennedy, M Kennedy. Griffin, Sutcliffe, Taberner for Pavlich, Sandilands, Hughes. Lemmens, Sexton, Fiorini for Hallahan, Joyce, Schoenfeld. Schulz, Toumpas, Neade for Dixon, Wingard, Austin. Int; Armfield, White, Sumner, Thomas. Dees are playing great footy at the moment, are still a slim chance for making finals so they will likely try to play out of their skins this week. Bernie Vince (Def/Mid $426,000 AF DT N/A) only relevant for AF, has had a few poor weeks in a row and hence is fairly cheap, he busted out a solid 110 last week and would be a prerade or sideways for say a Bartel. Inter; Bastinac, Mathieson, Paine, Hammelmann. Inter; Kersten, Lang, Menegola, Ruggles. Mackie, Lang in for Bartel, Caddy. Confirmed to debut earlier in the week Josh Clayton (Def/Mid $125,000 AF $128,200 DT) is yet another rookie to play for Brissy this year. His DPP status and cheap price will make him a popular trade in this week. Int; Cooney, Langford, McKenna, Jamar. Jamar, Langford, Parish for Simpkin, Polkinghorne, Grimley. Inter; Hrovat, McLean, Webb, R Smith. R Smith, McLean in for Suckling, Stringer. A combination of cheap price, playing bombers this week and freo next week, scoring 112 and being a proven premium has put Luke Dahlhaus (Fwd $424,000 AF $434,400 DT) as a very popular pick up in your forward line if you need a last upgrade or move on an under performer. Id have to say Grundy on recent form. How well Jacobs comes back from injury adds some risk. bamboozled by close being dumped from lions line up. Boy the Traders are pretty precious I make a comment that contradicts one of them and it doesnt see the light of day [this on the OFF AFL Site]. MY offering was that Dangerfield will spend a lotta time on the pine against Bris. They get hundreds of comments/questions through, most of them wont get on the page. He’s named. We all know that a late out is an option though. keep an eye on the press and sunday extended benches. I would say Stef Martin to sam Jacobs or Maybe even Grundy. JJ will score 100+ on the bombers this week. With smith still named, dosent look good for Stef after what we have seen with the 2 rucks. Those Sunday extended bench selections are always so important. You could say that about any of those 3 in your team really. I’d drop Stef if Archie is in. Grundys recent form has been great. Goldi has been struggling a bit. You have to judge a player on recent form IMO so I’d say Grundy all the way. Mid: Trelor v Bont v Sloane v lewis or Lachie neal. Which to keep out of Bartel, Duncan and Stef? Duncan scores poorly at gabba with two 50’s in last two there, bartel has been poor in general and stef is poor with archie in the side. Thoughts? Tough call. Depends a bit on who you can get in as a replacement for all 3. Like if you can afford any upgrade, Id say Duncan because the Uber premiums in the mid are just so much better than Def premiums, and ruck premiums (with exception perhaps if you dont already have Gawn). Cant complain with either of those trades. I disagree. Duncan has been very consistent scoring hundreds most weeks and last week was his only real down game for ages. He plays the lions who he scored 123 against last time as the highest scorer. Stef has not scored a decent score with another ruckman in the team. Bartel has been a yoyo. Your best bet (unless Archie Smith is dropped) is to upgrade one of those two, as there are better odds of turning a 65 into 100. Chances are Duncan will score around the 100 mark, and there’s no guarantee that your new midfielder will significantly beat that. Best Fwd premo to upgrade kerridge to? Already have Dusty, Miller, Zerret, Zorko, Nroo. probably dahl for price and great two games left. Already traded Dahl in. Nice to have independent confirmation. Ive got a similar delema.. nroo or montangna or hall? Take a punt on Nic Nat, he had a great comeback match. Mitch Robinson has been up and down this year. Or take a punt Elite style on a key forward to gun for 2 weeks. trades currently are collins > clayton and tadams > bont. who has better JS out of clayton, elton and possibly smith? Have 393k for mid. Any standouts? Would anyone go wells to Dahl for better run home ? Sam Menegola or rupert wills on field score this week?? Yep, gone Mumford for now, just worried about his match up with Goldy next week. Still got Josh Smith on my backline. He’s scored well in recent weeks but not sure I trust him this week. Thinking a trade for either Hodge, Houli or Enright. Thoughts? Thanks for a good year of dream team Shags. Worried about R.Gray… whats he gonna do this weekend? was thinking sideways trade him Dahlaus. thoughts? Is it going to rain on Saturday in Melbourne? Planning to bring in Houli. Anyone know when Geelong are flying up to BrisVegas? Anyone out there keeping any eye on who’s at the airport and who missed out? With only 4 trades to go in AF, is it a waste to downgrade 1 of this weeks trades to generate cash next week? wow, still 4 trades left? i think you can afford to use 1 trade to downgrade for cash generation, then you can lend me another trade. no? I did mean afl fantasy where we all have 4 trades left….. Which is the best option Goldy, Mummy or Nic Nat? Menegola or Rupert Wills ? All the news, rumours, and team sheets for round 5! All the news, rumours, and team sheets for Round 4! All the news, rumours, and team sheets for Round 3! All the news, rumours, and team sheets for Round 2!